Pilots were forced to make an emergency landing on a public road near Kiwawu village after both engines experienced a power loss apparently because of fuel starvation. No person inside the aircraft was injured in the event. 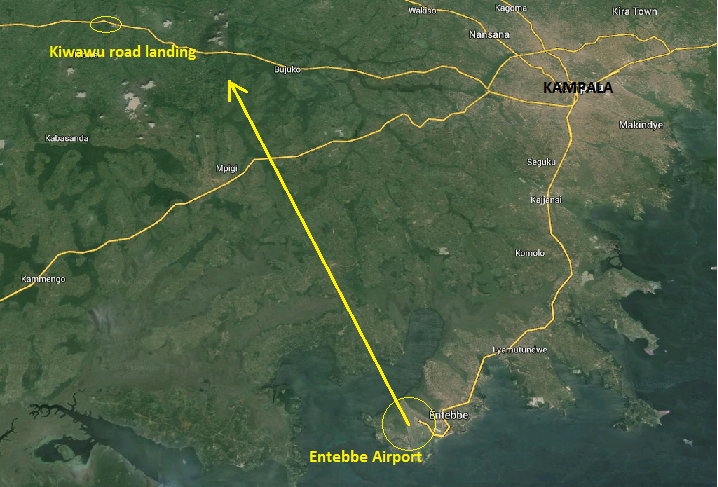 The landing site was the main road between Kampala and Mityana about 25 km north of the departure airport at Entebbe. The aircraft came to rest in the middle of the asphalt road at a upsloping terrain. On, or just before landing, the aircraft clipped power lines resulting in minor damage. During landing run, some larger vehicles had to pull up to the side but it is understood the no collision took place. The CASA 212 was chartered on behalf of the US Armed Forces carrying US marines to southern Sudan.